If you are in the business of duplicating flash media, USB drives for example, this scenario probably won’t seem too unfamiliar—while producing batch after batch of drives, copying slowed down all of a sudden, and the progress percentage number seemed to linger forever. The operator would usually be struggling between rebooting and praying for the process to go through without the endless wait. No matter which approach was adopted, quite often the culprit turned out to be one extremely slow USB drive that pulled back the whole pack. But is there any way to identify which one? The answer is YES with U-Reach’s Intelligent 9 Flash Duplicators. In the scenario above, the slot number with the slowest copying so far will be displayed on the LCD screen, thus giving the operator a chance to remove the corresponding drive without giving up the progress made with others. This elimination process can continue until the overall performance climbs back to normal. It’s not only the time saved, but also the quality of your service maintained. 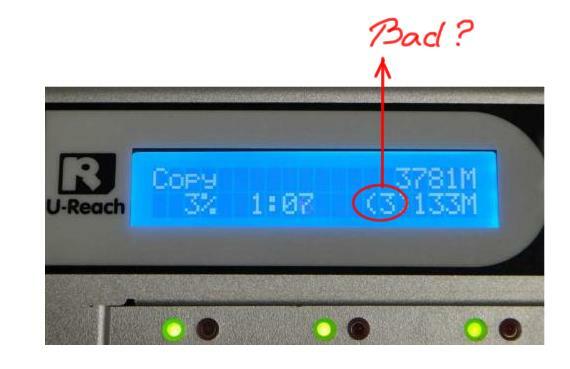 When it takes much longer than expected to copy a particular drive out of a batch, this drive most likely is inferior, if not defective. Think about passing on such a product to your customer, shouldn’t you be doing just like the old saying goes…don’t let the bad apple spoil the barrel!